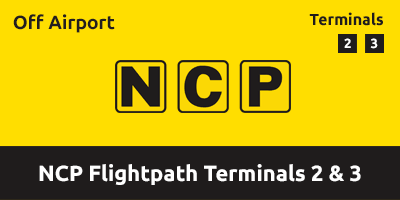 If you're flying from Terminals 2 or 3, you can't get much closer than the conveniently located NCP Flightpath car park. It's perfect if you're looking for a great value parking that doesn't compromise on location or security. When you return, our shuttle bus departs every 20 minutes from terminal 2 at bus stop 17 and from terminal 3 at bus stop 22. The car park features CCTV, security fencing entry and exit barriers plus regular patrols. Follow signs for Central London and Terminal 4. Keep in the far left lane and turn left at the traffic lights. Turn left, going over the bridge. The NCP car park will be directly in front of you. Drive up to the barrier, the Automatic Number Plate Recognition system will recognise your booking and the barrier will rise. Enter the car park and drive into a vacant space. Take a transfer bus to the terminal. If your number plate is not recognised, please press the button for assistance. Please look after you ticket as you need it upon return. Please ensure you allow sufficient time to complete your vehicle check-in and airport transfer. Make your way to the bus stop outside the terminal and take the bus to the car park. Collect your car from where you originally parked. At the exit barrier, please insert your ticket so we can validate your booking, and raise the barrier. If you have overstayed your booking, your additional charge will be displayed, which you'll need to pay. If the barrier does not rise on exit, press the assistance button and staff will help you.